The Essential Digital Video Baby Monitor offers essential functions so you can see your child at all times, and stay in contact both when indoors and outdoors. Its large 2.4-inch display and the adjustable infrared video camera (which also works in the dark) provide and excellent picture and perfect shot. The dual steady or variable intensity function of the small night light keeps the little one company while they sleep or just before. If voice activation is set, the parent unit will only be activated if sounds are detected by the baby unit. The digital technology employed allows interference-free reception and a high standard of privacy. Both units (parent and child) can operate with batteries (one rechargeable lithium battery included for the parent unit) or an AC adapter (two included). 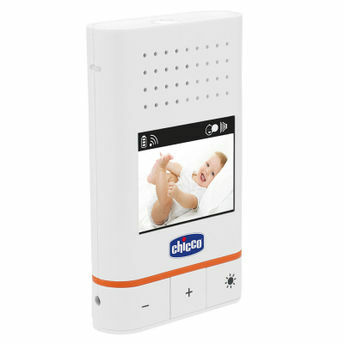 Essential Digital Video Baby Monitor Transmission frequency band: 2400-2454 MHz. Operating Range: approx. 150 meters. High immunity to interference caused by analogue devices.